Night is quickly approaching as we paddle our kayaks across Las Croabas Bay, maneuvering around the anchored sailboats whose halyards are snapping in the light wind. To our right is the vast Atlantic Ocean, but we steer instead for the narrow mangrove inlet that snakes its way towards Laguna Grande, one of only five bodies of water in the world where bioluminescent creatures, often known as the "burning of the sea," live year round. It is dark and the moon is hidden behind a bank of clouds and so the only lights we have to follow are the glow sticks on our life jackets and the stern of the kayak ahead of us. "This is just the way it should be," says my friend Jody, who has taken this trip several times before. "If the moon were out, we wouldn't be able to see them." By them she means the tiny phosphorescent organisms that live, 450,000 to the gallon, in Laguna Grande de Fajardo, accessible only through the mangrove canal and only by kayak as motorboats are prohibited. A little light might be nice, I think, as we navigate among the mangroves whose roots, which twist up above the waters along the narrow channel in a latticework pattern, collecting debris from the falling leaves and palm tree fronds. The jungle beyond is deep, dark and seemingly impenetrable. We are lucky on the way into the lagoon, as the current tugs us along. And because my 12-year old daughter Nia and I frequently kayak, we're able to maneuver around the turns and bends better than some of the others in the long line of kayaks that follow behind us. We had started earlier this evening, just after a heavy rainstorm, in Parque Las Croabas, a small park about an hour and a half outside of San Juan, where we are staying at the Marriott in the hip and lively Condida section of the city. It seems a long way from the sophisticated hotel, restaurants and shops that make up that area, and my daughter is wondering why we didn't stay by the pool that overlooks the ocean. It is, she tells me more than once, hot and humid in the channel and the trip so far, about 30 minutes, a little long. She is, unfortunately, entering those teenage years where such adventures somehow pale in comparison to going to the mall. The park, a vast expanse of green along the rocky edge of the bay, was filled with kayaks in colorful shades of yellow, red, green and blue. 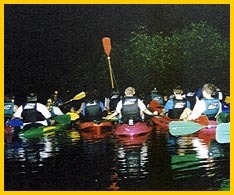 There are several tour companies that assist kayakers into the lagoon and in our group there were about 45 people, some of whom had never kayaked before. I am glad that we have more experience than that, but after the safety instructions given by our guides, there have been no accidents in the channel, which is good. I shudder to think about finding myself in the murky waters of the mangrove canal. Bugs are not a problem as we slathered on organic bug lotion, provided by the tour company, Eco Xcursion, before we left. As we get into the steady rhyme of kayaking, Nia's complaints start to lessen. There is a sharp turn to the left and then the channel begins to widen, the mangrove roots receding into the dark dense forest and within minutes we are entering the shadowy waters of Laguna Grande. Almost at the same moment as the waters open up, Nia gives a little cry. I look back and see that her oar, as it lifts out of the water, is trailing sparkling iridescent white froth and as it enters again, the dazzling bubbles, like costly champagne, encircle the flat surface of the paddle. I dip my hand into the water, letting it trail along as my kayak glides forward. It is the same-glittery confetti lighting up the black night--and though I knew, from having read and listening to Jody, that this would happen, the experience is more awesome than I expected. My hand drips glowing water droplets. I never tire of watching them glow, dripping like stardust back into the water. We are the first to enter the lagoon and the same cry I heard from Nia echoes down from the other paddlers as they leave swaths of glowstick-like paths. These are, we have been told, bioluminescent organisms, living creatures that emit light. Think lightening bugs, only many more, much smaller and under water and you get an idea of what they're like. It isn't totally understood says Juan Ruiz, our lead guide, why these few bays are filled with bioluminescent creatures. It is known that the bays where they are found are all small, averaging 100 acres of open water, shallow (none are more than 14 feet deep) and cut off from the sea and accessible only by a narrow channel which is also shallow. And the mangroves play a part in this too-all the bays are ringed by mangrove trees. 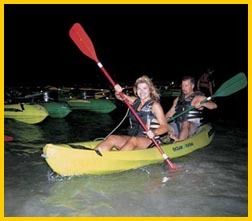 We kayak around the lagoon, it is totally dark and silent, the kayakers just shadows against the water-most of the light coming from the creatures in the bay. It is with regret that we start our paddle back. The current is against us and strong, but we manage, leaving the inlet and entering back into the waters of Las Croabas Bay. The wind is even stronger and there is a slight chop to the inky waters. But then the moon comes out and we can see El Faro (the Fajardo Light House) and houses that line the hills in the background. My daughter isn't complaining anymore. She would like to come back to Laguna Grande someday. For more information contact Eco Xcursion at 787- 888-2887. For more a complete trip call Travel Services, Inc. at 787 982-1200 or see their website at DestinationPuertoRico.com . ...... Jane Ammeson writes about travel, food and personalities. Her work has appeared in Home & Away, Northwest Airlines World Traveler Magazine, the Chicago Tribune, the Grand Rapids Press, the Courier Journal, Fifty Plus and Chicago Life Magazine.